Design collective Penda designed Blossom Gate, a dramatic sculptural entrance to a flower garden in the Chinese city of Xiangyang. 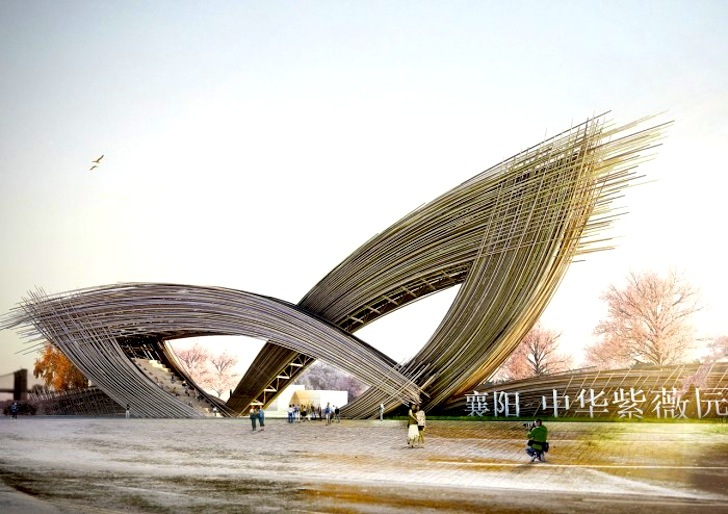 Inspired by traditional Chinese calligraphy, the conceptual gateway is formed from overlapping lengths of dried bamboo curved into the shape of petal-like brushstrokes. Winner of a 2013 design competition, Blossom Gate challenges the traditional notion of a gateway as an element of division and reinvents the threshold as a place for connection and social gathering. Like many of Penda’s works, Blossom Gate celebrates bamboo architecture by using the sturdy grass for both the inner framework and the facade. Located in front of the city’s largest myrtle flower garden, the gateway resembles two crisscrossing flower petals that are hollowed out in the middle to provide access to and framed views of the landscape. The petal-like frames are covered in hundreds of overlapping individual bamboo pools, mimicking fine and quick brushstrokes. Tiered seating and stairs are built into the middle of the sheltered structure to create a new social gathering space. Envisioned as a major city landmark, the architects have proposed a variety of recreational activities that the Blossom Gate could host such as Sunday markets, outdoor movie screenings, and concerts. A modified version of the design is slated for completion this fall. The petal-like frames are covered in hundreds of overlapping individual bamboo pools, mimicking fine and quick brushstrokes. Winner of a 2013 design competition, Blossom Gate challenges the traditional notion of a gateway as an element of division and reinvents the threshold as a place for connection and social gathering. Like many of Penda's works, Blossom Gate celebrates bamboo architecture by using the sturdy grass for both the inner framework and the facade. Located in front of the city's largest myrtle flower garden, the gateway resembles two crisscrossing flower petals that are hollowed out in the middle to provide access to and framed views of the landscape. Tiered seating and stairs are built into the middle of the sheltered structure to create a new social gathering space. 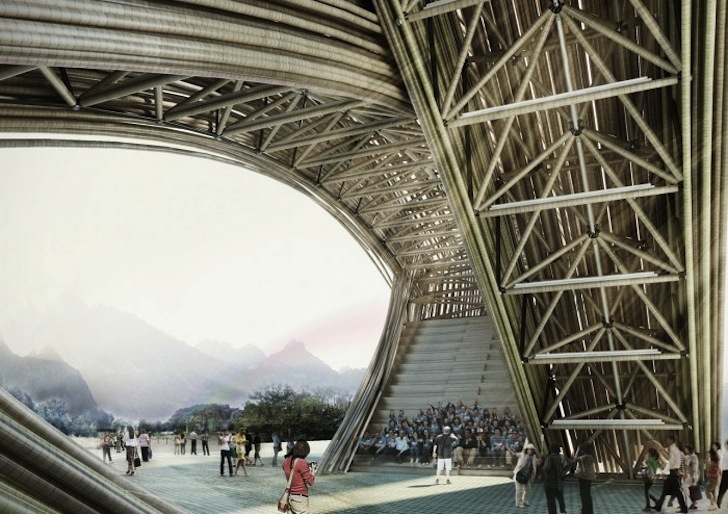 Envisioned as a major city landmark, the architects have proposed a variety of recreational activities that the Blossom Gate could host such as Sunday markets, outdoor movie screenings, and concerts.